Let's tailgate with everyone! This is the cutest and most original longall or John John we've made in a while. 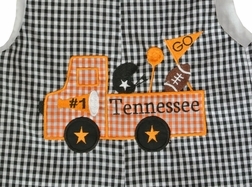 We found this adorable truck with all the items you need to cheer on your favorite team. The little pom pom is 3D!